Monday’s are notoriously a light volume trading session which usually favors the upside action in the major stock indexes. This morning the trading volume is extremely light as the SPDR S&P 500 Trust (NYSE:SPY) is trading just 29 million shares as of 10:28 am EST. 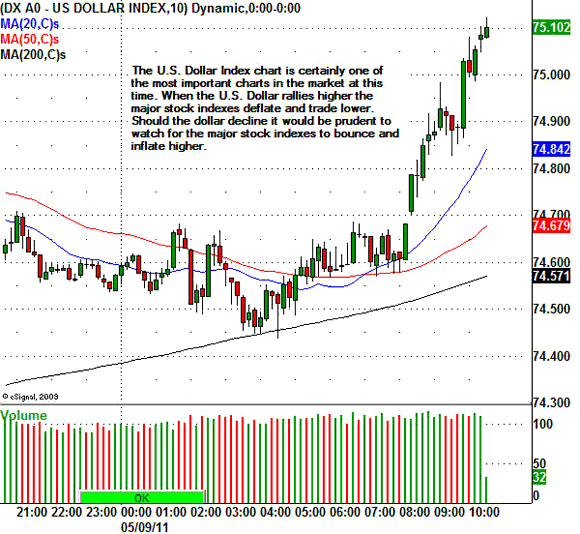 Normally, light volume will often help to lift the major stock indexes, however, the U.S. Dollar Index is also trading higher by 0.34 cents to $75.07 per contract. When the dollar trades higher the major stock market indexes will usually deflate and trade lower. That is exactly the case this morning, as the Dow Jones Industrial Average, S&P 500 Index, and the NASDAQ Composite, are all trading slightly lower this morning. Will Japan Take a Samurai to the Dollar?